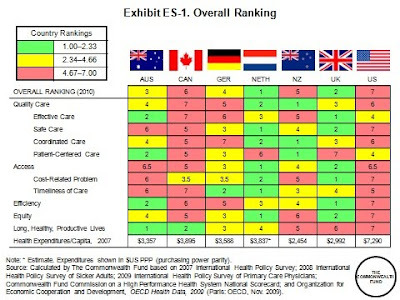 A new Commonwealth Fund study reports that despite having the "most costly health system in the world, the United States consistently underperforms on most dimensions of performance... 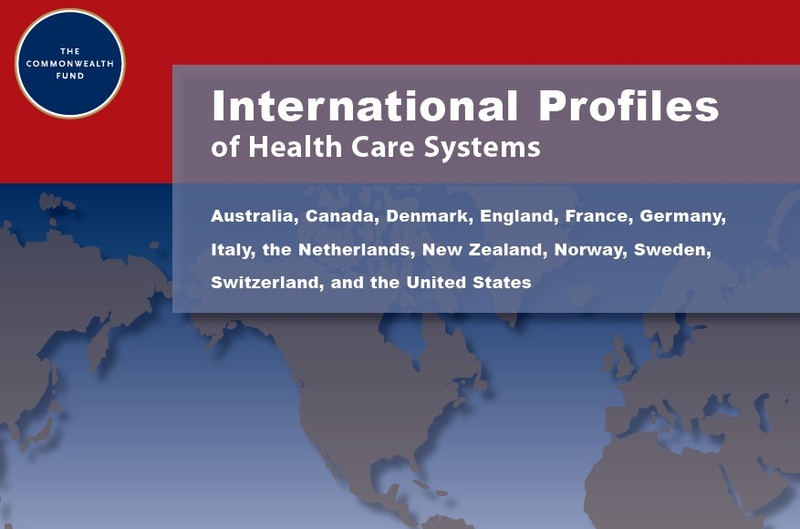 Compared with six other nations—Australia, Canada, Germany, the Netherlands, New Zealand, and the United Kingdom — the U.S. health care system ranks last or next-to-last on five dimensions of a high performance health system: quality, access, efficiency, equity, and healthy lives." "The most notable way the U.S. differs from other countries is the absence of universal health insurance coverage. Health reform legislation recently signed into law by President Barack Obama should begin to improve the affordability of insurance and access to care when fully implemented in 2014. Other nations ensure the accessibility of care through universal health insurance systems and through better ties between patients and the physician practices that serve as their long-term “medical homes.” Without reform, it is not surprising that the U.S. currently underperforms relative to other countries on measures of access to care and equity in health care between populations with above-average and below-average incomes. But even when access and equity measures are not considered, the U.S. ranks behind most of the other countries on most measures. With the inclusion of primary care physician survey data in the analysis, it is apparent that the U.S. is lagging in adoption of national policies that promote primary care, quality improvement, and information technology. Health reform legislation addresses these deficiencies; for instance, the American Recovery and Reinvestment Act signed by President Obama in February 2009 included approximately $19 billion to expand the use of health information technology. The Patient Protection and Affordable Care Act of 2010 also will work toward realigning providers’ financial incentives, encouraging more efficient organization and delivery of health care, and investing in preventive and population health. For all countries, responses indicate room for improvement. 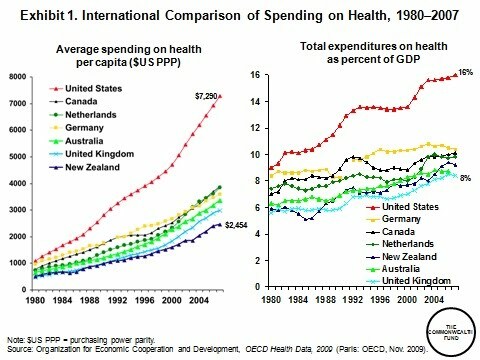 Yet, the other six countries spend considerably less on health care per person and as a percent of gross domestic product than does the United States. These findings indicate that, from the perspectives of both physicians and patients, the U.S. health care system could do much better in achieving value for the nation’s substantial investment in health. Quality: The indicators of quality were grouped into four categories: effective care, safe care, coordinated care, and patient-centered care. Compared with the other six countries, the U.S. fares best on provision and receipt of preventive and patient-centered care. However, its low scores on chronic care management and safe, coordinated care pull its overall quality score down. Other countries are further along than the U.S. in using information technology and managing chronic conditions. Information systems in countries like Australia, New Zealand, and the U.K. enhance the ability of physicians to identify and monitor patients with chronic conditions. Access: Not surprisingly—given the absence of universal coverage—people in the U.S. go without needed health care because of cost more often than people do in the other countries. Americans with health problems were the most likely to say they had access issues related to cost, but if insured, patients in the U.S. have rapid access to specialized health care services. In other countries, like the U.K. and Canada, patients have little to no financial burden, but experience wait times for such specialized services. There is a frequent misperception that such tradeoffs are inevitable; but patients in the Netherlands and Germany have quick access to specialty services and face little out-of-pocket costs. Canada, Australia, and the U.S. rank lowest on overall accessibility of appointments with primary care physicians. Efficiency: On indicators of efficiency, the U.S. ranks last among the seven countries, with the U.K. and Australia ranking first and second, respectively. 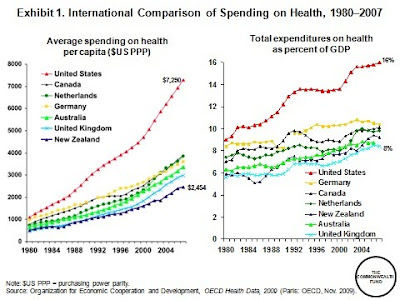 The U.S. has poor performance on measures of national health expenditures and administrative costs as well as on measures of the use of information technology, rehospitalization, and duplicative medical testing. Sicker survey respondents in Germany and the Netherlands are less likely to visit the emergency room for a condition that could have been treated by a regular doctor, had one been available. Equity: The U.S. ranks a clear last on nearly all measures of equity. Americans with below-average incomes were much more likely than their counterparts in other countries to report not visiting a physician when sick, not getting a recommended test, treatment, or follow-up care, not filling a prescription, or not seeing a dentist when needed because of costs. On each of these indicators, nearly half of lower-income adults in the U.S. said they went without needed care because of costs in the past year. Long, healthy, and productive lives: The U.S. ranks last overall with poor scores on all three indicators of long, healthy, and productive lives. The U.S. and U.K. had much higher death rates in 2003 from conditions amenable to medical care than some of the other countries, e.g., rates 25 percent to 50 percent higher than Canada and Australia. Overall, Australia ranks highest on healthy lives, scoring in the top three on all of the indicators." Brad Wright dishes a special Research Edition of Health Wonk Review at Wright on Health timed to coincide with the Annual Research Meeting for AcademyHealth in Boston. Healthcare Technology News story on Defensive Medicine is featured, along with the best of the policy blogosphere. Guest author John Halamka is Chief Information Officer of Beth Israel Deaconess Medical Center and the Harvard Medical School. In my recent Leiter Lecture, I spoke about the idea that decision support services should be available in the cloud. BIDMC has 2000 decision support rules. Brigham and Women's has 2000 decision support rules. They are entirely different rules maintained by two teams of experts. That's lunacy. Shouldn't we have have a single set of evidence-based rules that everyone in the country can use? But how would it work and what standards would be used? I serve on the Board of AnvitaHealth (note the Conflict of Interest), which is working on this problem. 1. First, rules need to be authored by experts or gleaned from the literature and represented electronically in a decision support cloud. 2. Second, an XML form of patient history needs to be sent to the Decision Support Service Provider. For example, the problem list, medication list, recent labs, age, and gender could be sent in a Continuity of Care Document without specific patient identifiers. Here's a concrete example. For brevity, I included only pertinent portions of the XML input data. The XML could contain any arbitrary length of data elements and codes sets. Here's an XML response that indicates a laboratory gap in care. In this case, the patient is taking an ACE Inhibitor and does not have recent serum electrolytes. The compliance to this rule is thus false (underlined). Thus, Anvita has defined clinical decision support (CDS) standards to transmit decision support recommendations from the service provider back to the EHR. I am unaware any widely implemented standards that do this today. Additionally, the XML response object is hierarchical. Any response (drug safety, gap in care, etc) can be drilled down further to any level of detail, including the drug package insert, for example. However, for speed of response, Anvita returns portions of the XML response initially. 1. The patient data set (longitudinal health record) can be sent to Anvita’s web service as XML or CCD. Anvita’s XML anticipates and extends attributes necessary for decision support, such as presence or absence of different types of dialysis, which are not yet required by CCD. 2. Anvita’s engine includes (a) decision support function requests (e.g., check drug dose, get formulary, find safety-check therapeutic alternatives, find gaps in care) and also (b) utilities, such as: search functions using descriptions within codesets like CPT, NDCs, the ability to find all drugs within a therapeutic class, find all LOINCs that infer the same physiologic laboratory test, etc. Anvita utilitizes freely available vocabularies for maintaining local dictionaries, their synchronization, and taxonomies. The modularity of (a) and (b) allows homegrown systems and next-generation applications to be developed without having to deal with the complexity of thousands of pages of implementation guides pertaining to drug databases, industry codes like CPT, LOINC, NDC, semantic interoperability between non-congruent databases (due to the Anvita Thesaurus), as well as coding of hundreds of quality/ performance measures that Anvita provides out of the box (e.g., HEDIS), in a plug-and-play fashion. 3. A decision support request, posed as XML, returns a response object for that request. The response XML can include drug safety analysis, gaps in care analysis and scoring, formularies, cumulative radiation exposure, etc. Therefore, Anvita is a generalizable, semantic search engine that executes in realtime as a web service. Anvita’s realtime capability not only enables decision support at the Point of Care, but business functions such as electronic prior authorization using EHR data (e.g., high tech imaging). 4. The analytical responses can be delivered as either XML (for instantaneous consumption at the Point of Care) or written directly to an alerts database (for population analytics). The analytical database can be viewed/queried directly by Anvita’s web-based tool or it can mined by 3rd party business intelligence tools (e.g., Cognos, Business Objects, JasperSoft, Pentaho). b. A Rules Management application, so that local organizations and physicians can decide and configure which rules to run (e.g., Meaningful Use), including the rules they’ve authored themselves and that might be proprietary (e.g., electronic prior-authorization criteria). I do not present this as an advertisement for Anvita, but as a generalizable, modular approach to decision support in the cloud that could be implemented by many companies instead of duplicating expert resources in every hospital and health information exchange. Decision Support Service Providers is a concept that is ready for prime time. A recent independent national physician Gallup survey commissioned by Jackson Healthcare found that physicians attribute 26 percent of overall healthcare costs to the practice of defensive medicine. Of the physicians surveyed, 73 percent agreed that they had practiced some form of defensive medicine in the past 12 months. Jackson Healthcare commissioned the Gallup survey after observing these startling findings in their own polling. 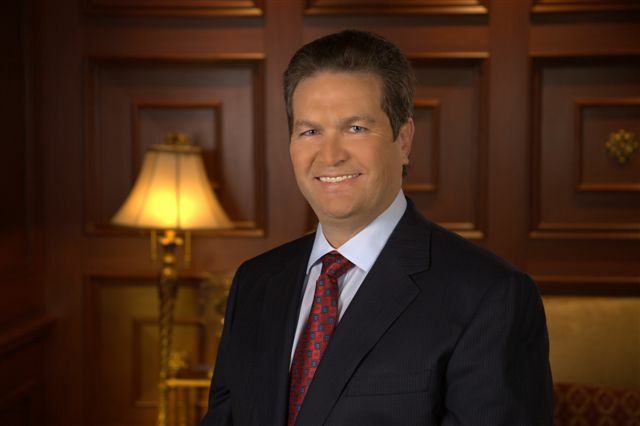 Rick Jackson, 30 year CEO of Jackson Healthcare, sat down with HTN to provide some background and insights. HTN: What led you to conduct these polls and what was your personal reaction? Rick Jackson: We felt we should ask physicians, who write the purchase order for most healthcare costs, what their opinion was on the Democratic and Republican version of healthcare reform. They came back overwhelmingly that changes have to be made in the legal system beyond capping malpractice and stabilizing the insurance market. 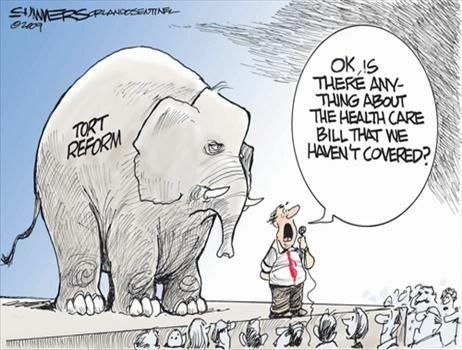 They felt we need true tort reform to eliminate the practice on defensive medicine. We then surveyed them on their opinions and practice of defensive medicine and were surprised by the findings. We commissioned Gallup to do an independent survey on this issue and the results were very close to our own survey. We were surprised by the emotion of the physicians and the findings from our survey. HTN: What are the root causes behind defensive medicine? Rick Jackson: Physicians are personally liable for any mistakes they make. Even if covered by malpractice insurance should an award exceed that amount the physician is personally liable. This environment causes them to assume a very defensive posture when interacting with patients. They have learned from their mentors “war stories” that it is always better to order tests, medication and treatments to prove that a condition exists and just as importantly that other conditions do not exist in their patients. HTN: What are the policy implications? Rick Jackson: If we could get our lawmakers to focus legal issues beyond what they describe as tort reform we could save the country between $650-$850 billion dollars PER YEAR. Physicians are leaving the profession in significant numbers. With the current environment, physicians are recommending their sons and daughter to NOT go into medicine. With the population demographics dictating the need for more physicians in the future, this is a disturbing trend. HTN: What reactions are you getting to the poll? From physicians? From Congress? Rick Jackson: We are pleasantly surprised that the dialogue has started including talk of defensive medicine. Our story was covered on CNN, and now there are stories on defensive medicine in Newsweek, MSNBC and other media outlets. Dr. Senator Coburn talked about our results at the Healthcare Summit. The physicians have had many positive comments. We also met with the policy people from Senators Coburn and McConnell as well as Congressmen Boehner and Price. Part II of the interview with Rick Jackson will appear in a subsequent post. NHIN Direct is an ONC led initiative to enable boundaryless secure point-to-point provider messaging to other healthcare stakeholders. NHIN Direct would provide a standards-based replacement to paper, fax and email-in-the-clear and a transport layer for system-to-system point-to-point messaging. The NHIN Direct Implementation Group is drawing close to its decision on the implementation approach. A convergence proposal has been submitted by NHIN Direct workgroup leaders David McCallie and this writer. The proposal centers on an SMTP backbone, with edge protocols that enable secure email, EHR workflow integration (using IHE standards) and system-to-system integration (using REST). This post is from Rich Elmore (Allscripts) and David McCallie (Cerner), with thanks and gratitude to many contributors and reviewers. A special thanks to the Concrete Implementation teams and the HIT Standards Committee review team that paved the way for this proposal. Following the NHIN Direct Implementation Group June face-to-face meetings, the following proposal emerged as having a reasonable potential for consensus. The core of the idea is to take the best aspects of each proposal and blend them together to create something that doesn’t have to compromise on any dimension. “Instantly on” – meaning that the global network can be built out in months, without central planning, using proven infrastructure and deep existing knowledge for this specific application (1a). Wes Rishel has described this as a “socially scalable” deployment architecture. A payload neutral content model shall meet entry-level providers where they are, but can scale up to the levels of metadata that are currently required by integrated health care settings and will be required by all providers to drive efficient and high quality workflows. The backbone protocol for NHIN Direct would be SMTP carrying S/MIME signed and encrypted messages. This approach will allow us to leverage existing software, infrastructure and business models to ensure that NHIN Direct service is immediately available to both large and small providers regardless of practice size and IT budget. In order to minimize the need to have end-users managing PKI certificates, we have designed and coded a transparent way for an organization and/or its users to delegate certificate management to a trusted HISP. The HISP will then transparently use DNS to locate and apply the user’s certificate (or the organization’s certificate) to convert the unencrypted message into a standard S/MIME message and verify an S/MIME signature. If an organization prefers not to sign a BAA with their HISP and prefers to manage certificates themselves, security can be performed within the organization. If the sender is unwilling to outsource encryption to the HISP, then the sender will have to perform any necessary XDM packaging (and encryption) before uploading the message to the HISP. NHIN Direct supplied libraries could be invoked locally to perform the XDM wrapping. The use of organization or user level certificates also allows our approach to manage “multiple circles of trust,” as required by the Privacy & Security principlesbecause each organization may independently chose which certificate authorities to accept, and which to reject. HISP-HISP conversations will be additionally encrypted using standard TLS using server certificates only (no client certificates) issued by an accepted Internet CA. This willguarantee a secure channel to protect the routing metadata while messages are being sent between trusted entities. Error and status messages will be returned as messages using the MDN content type. We recommend that clients create metadata attachments whenever possible. As a general rule of thumb, the sender is recommended to create as “rich” a metadata package as possible. The receiver should use as much received metadata as possible, and will be expected to send a “bounce” message back to the sender if the message cannot be processed, or the metadata does not meet the receiver’s standards. A key goal here is to provide a “bootstrapping” pathway that lets clients move from “no metadata” to full metadata without having to change messaging platforms. A provider should be able to start out with a simple an email client, and then move to an EHR module, and then to a full EHR without changing HISP or secure NHIN-Direct addresses. Our approach follows the same content standards as are used by XDR with the design criteria to avoid changes to the EHRs. It would also follow and leverage the “step up” and “step down” gateway code created by the SOAP team. It would follow any new profiling standards from IHE that would guide the proper use of “minimal” content metadata for those clients who cannot generate full metadata. The REST reference implementation will be specifically tuned to ease creation of the metadata package transparently. A reference implementation of a simple REST interface will be exposed to the edge to support a more familiar integration approach for developers comfortable in that environment. This interface will also enable rapid innovation through the addition of new methods as needed. The REST interface can be used to create novel integration points, such as web-based portals, for secure message-handling. We propose to create a reference implementation of a simple web-based portal, as part of the pilot deliverables. A basic client interface will be provided by exposure of standard POP/IMAP email services. To ensure edge on-the-wire privacy, all clients will be required to use TLS with a server certificate only to connect to the HISP. Authentication could be username/password and/or client certificates. To minimize the risk of mistaking a non-secure email account with the secure email account, we recommend (but don't require) that clients use a separate email instance to connect to their HISP, where this is technically supported by the client, rather than managing two accounts from one email client. This would be similar to using one client for personal email and a different client for corporate email. Our reference implementation will include instructions to pre-configure email clients to ensure secure communication with a HISP. Together, a reference implementation built to support this proposal is able to expose all three of XDR, REST and SMTP/POP3/IMAP as peer interfaces to edge clients. It will provide immediate utility for providers with limited IT capability, maximize the acquisition and exchange of content metadata, and provide a surface for rapid innovation. Health IT - "Every provider, every patient will benefit"
National Coordinator for Health IT David Blumenthal has sent the strongest signal yet that requirements aren't likely to relax substantially from the proposed rule. His latest post makes the case that providers and healthcare organizations have a principled obligation to adopt Health IT as contemplated by HITECH. Blumenthal asserts that "while large hospital networks and smaller providers may be stretched to meet national health IT goals, it is not beyond their capacity for growth." Introducing change in health care is never easy. Historically, adopting our most fundamental medical technologies, from the stethoscope to the x-ray, were met with significant doubt and opposition. So it comes as no surprise that in the face of change as transformational as the adoption of health IT – even though it carries the promise of vastly improving the nation’s health care – some hospitals and providers push back. I resisted using EHRs while an internist in Boston, as I wrote in my blog, “Why Be a Meaningful User.” Over time, however, I found that working with health IT made me a better and safer physician. Most importantly, my patients received better, safer care and improved outcomes. Americans deserve better health care than they are currently receiving, and they need it delivered more efficiently. Every provider, every patient throughout our nation will benefit from the goals envisioned by the HITECH Act. Yes, this will be a challenge. While large hospital networks and smaller providers may be stretched to meet national health IT goals, it is not beyond their capacity for growth. Doctors and hospitals will not have to go it alone. Programs, such as our 60 Regional Extension Centers located throughout the United States, are working hard to ensure that providers have all the necessary resources to meet the challenge. The incentive program will then provide reimbursement to providers who have achieved meaningful use. The Community Health Data Initiative was launched yesterday at a forum in Washington D.C., chaired by Institute of Medicine (IOM) President Harvey Fineberg and HHS Secretary Kathleen Sebelius. Data sources related to the initiative are available at HHS.gov/Open. The brains behind this initiative: Chief Technology Officer Todd Park. "The Community Health Data Initiative is a major new public-private effort that aims to help Americans understand health and health care performance in their communities -- and to help spark and facilitate action to improve performance. The fundamental approach being taken by the initiative is to catalyze the advent of a network of community health data suppliers (starting with HHS) and “data appliers” who utilize that data to create applications that (1) raise awareness of community health performance, (2) increase pressure on decision makers to improve performance, and (3) help facilitate and inform action to improve performance. The approach we’re taking has two parts. First, we will be providing to the public, free of charge and without any intellectual property constraint, a Community Health Data Set harvested from across HHS – a wealth of easily accessible, standardized, structured, downloadable data on health care, health, and determinants of health performance at the national, state, regional, and county levels, as well as by age, gender, race/ethnicity, and income (where available). This data set will consist of hundreds (ultimately, thousands) of measures of health care quality, cost, access and public health (e.g., obesity rates, smoking rates, etc. ), including data produced for the Community Health Status Indicators, County Health Rankings, and State of the USA programs. It will include a major contribution of new national, state, regional, and potentially county-level Medicare prevalence of disease, quality, cost, and utilization data from the Centers for Medicare and Medicaid Services (CMS), never previously published, as well as data for measures tracked by Healthy People 2020. And it will include information on evidence-based programs and policies that have successfully improved community performance across many of these measures. While the initial Community Health Data Set is a set of data files downloadable from a webpage, we will be deploying a new data warehouse and web portal to deliver it with maximum efficiency (including exposing the data via a web service) by the end of 2010. The data warehouse and portal are currently under development at the National Center for Health Statistics. Through this dialogue, the public-private Community Health Data Initiative team is recruiting companies, nonprofit organizations, advocacy groups, and innovators of all stripes to utilize the data HHS is providing and develop applications for the public along the lines of the above – and also provide feedback on what data going forward would be most useful for HHS to supply. The objective is not only to deploy the HHS Community Health Data Set, but also to trigger the creation and use of an ever-growing array of new applications that increase awareness of community health performance and spark action to improve performance – with the ultimate metric of success being improvement in the very health measures that are being surfaced via the data set. And it’s an initiative for which we also plan to share our core methodologies and program materials with other agencies across the government who have already begun to express interest in replicating this approach in other sectors. In sum, the Community Health Data Initiative is working to leverage the power of transparency, participation, and collaboration to improve community health. It’s not an initiative owned by any one organization. It’s an American initiative, embodying the spirit of commonwealth and which will enable us to do things that can only be done when we all work together. And it’s an initiative for which we also plan to share our core methodologies and program materials with other agencies across the government, who have already begun to express interest in replicating this approach in other sectors."